"My husband Ron and I have made two kitty Cities! 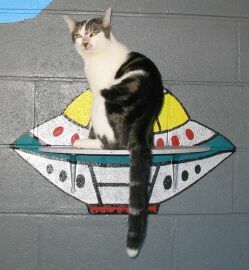 The first is located at the Attleboro Animal Shelter, Attleboro, MA. It's an old, depressing, run-down place where the cats were kept in small cramped cages 24 hours a day. When adopters came to meet a cat, they walked down row after row of cages peering into them and all they saw was a cat, a litterbox, food and water dish. It killed me that the cats had no place to stretch their legs, lie in the sun, breathe some fresh air, and interact with each other. 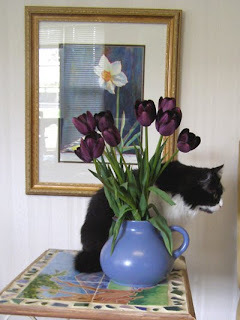 "At the time I volunteered there, Friskies was having a contest where you could win a $10,000 shelter makeover from the designers of Trading Spaces. I entered it, and when we didn't win, I said who needs them, I'll do it! " "I pitched my idea and got approval. We started by knocking a hole through a cinder block wall and installing a small door. It opened into an outdoor chain-link-enclosed dog kennel. Next came a roof, and plywood attached to the chain-link. It was painted, then colorful climbing shelves were added. " "There were two painted walls, one was the DAY wall with a blue sky. " "The shelves were: a tree swing, a birds nest, a yellow daisy, clouds, sun and rainbow. " "The other was the NIGHT wall with a UFO, Space Shuttle, and Planet Saturn." "The door in and out was the Lunar Module. The other two walls were open chain link to let in fresh air, but had a long sitting shelf the entire length." 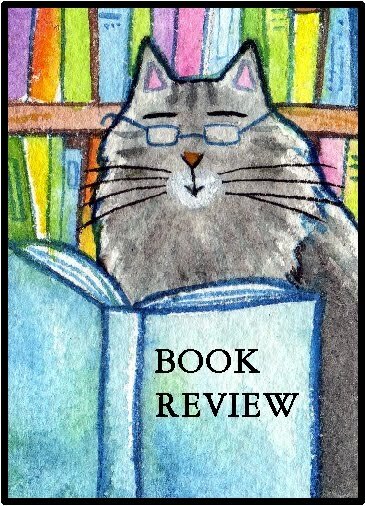 "Kitty City serves as a bright cheerful place where the cats can go to have a break from their cages, and people can go to meet the cats and see them playing and acting like cats!" Kitty City number two is at Angelcat Haven and has an undersea theme. Watch for photos in Part II --coming soon! 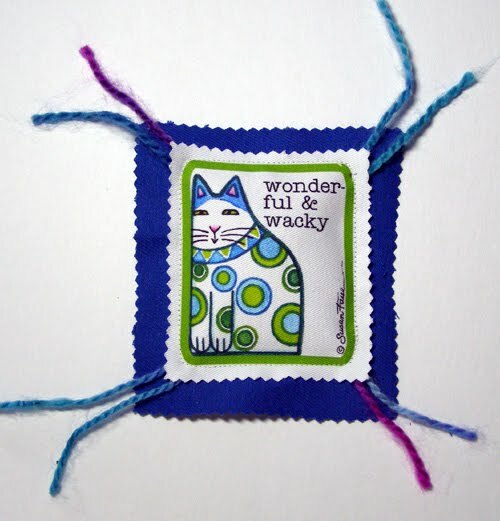 SUNDAY, JUNE 6: If you are in the New England area, be sure to visit Cat Lady Rose and Angelcat Haven at the Whisker Walk event next weekend. Whisker Walk is a FREE, fun day for families and their dogs PLUS a dog walk-a-thon fundraiser to benefit animal shelters and rescue groups throughout New England. Held at the Lancaster Fairground (Home of the Bolton Fair) there are 50+ acres for pet owners and animal lovers to walk, visit vendors, see, do and buy PLUS they can lend a paw for the animals shelters and pet rescues they love and support! 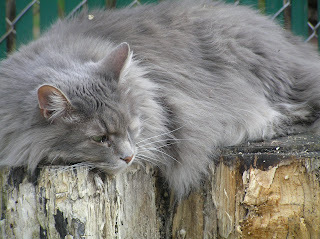 Even if you can't attend, please consider supporting Rose's Angelcat Haven. Buttonwillow would like to thank all of our dear readers who helped to make her dream come true--a life-long wish to become an artist's model. Your votes helped determine the best pose for the upcoming painting whose working title is"Still Life With Bicolor Cat." Pose B (pictured here) won by a landslide. Stay tuned over the next few weeks as I show you step-by-step how this painting will progress, and thank you for your valuable input! 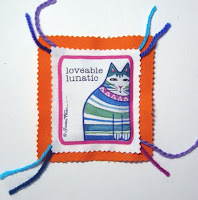 Denise H, who won the Crazy Cat Lady Magnet. 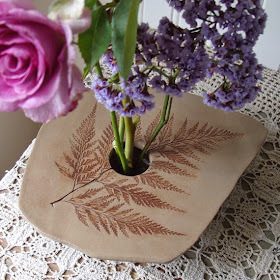 Denise is a talented pottery artist and you'll want to be sure to visit her Etsy shop A Piece By Denise . Her ceramic travel mugs are a great idea! 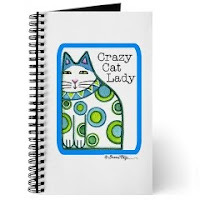 Cat Lady Susan B, a writer and blogger, appropriately won the Crazy Cat Lady journal. 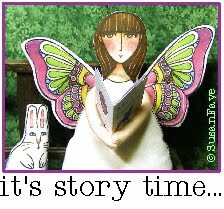 She lives with her husband and 5 cats and is working on her first novel. 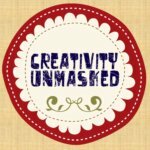 You can keep up with her at her blog Rambling Thoughts and Thoughtful Ramblings. 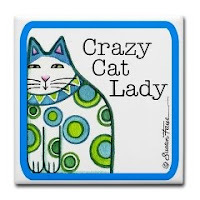 Patty P, a member of the International Society of Glass Beadmakers won the Crazy Cat Lady ceramic tile coaster. 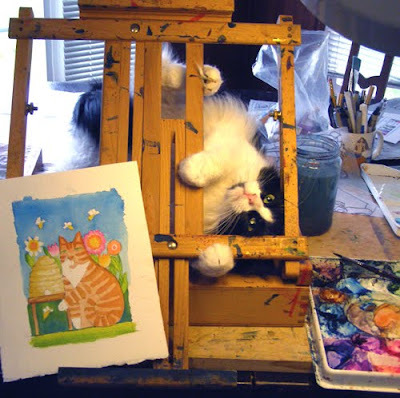 You can see some of her beautiful work at her website Rustic Studio where the studio is rustic, not the art!! Congratulation winners!! Be sure to send me your mailing information if you haven't already (You'll find my email link under my About Me profile) . A big thank you to everyone who participated and contributed feedback!! IT'S BABY RACCOON TIME! 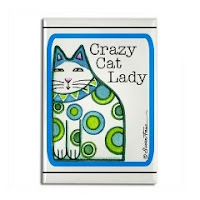 Did you know that Cat Lady Sarah moonlights as "The Grape Lady" while hubby and Feline Fella Bill also wears a "Cracker Man" hat? 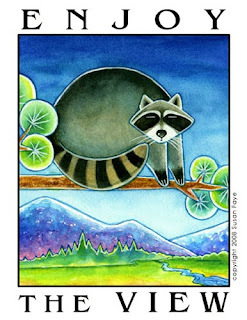 Check out The Raccoon Chronicles for Sarah's latest photos of three new arrivals. They are so cute that it makes you want to pinch their chubby little cheeks, but Sarah reminds us "raccoons are wild animals, don't try and approach or feed them if they are not familiar with you. Use extreme caution and common sense." 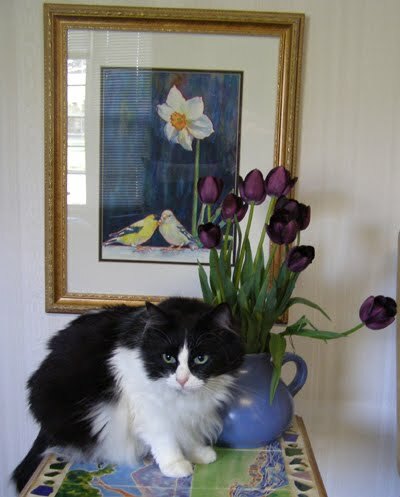 Editor's Note: Our heartfelt condolences go out to Sarah and Bill for the loss of their beloved Lucy who recently passed away at the age of 17. 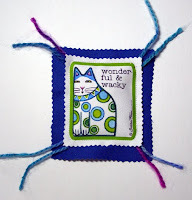 SUNDAY, JUNE 6: If you are in the New England area, be sure to visit Cat Lady Rose of Angelcat Haven at the Whisker Walk event next weekend. Whisker Walk is a FREE, fun day for families and their dogs PLUS a dog walk-a-thon fundraiser to benefit animal shelters and rescue groups throughout New England. Held at the Lancaster Fairground (Home of the Bolton Fair) there are 50+ acres for pet owners and animal lovers to walk, visit vendors, see, do and buy PLUS they can lend a paw for the animals shelters and pet rescues they love and support! Even if you can't attend, please consider supporting Rose's Angelcat Haven. They're Here! 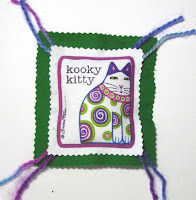 New Catnip Toys and a Giveaway! 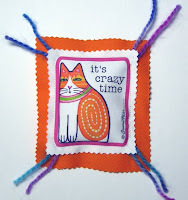 By popular demand...Presenting the first batch of catnip toys from Susan Faye Studios! 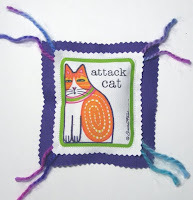 Delight your favorite feline with a deliciously colorful hand-crafted catnip toy that looks like a ravioli and spaghetti all rolled into one. 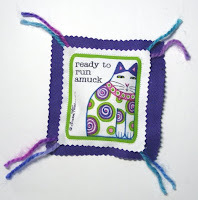 Chock-full of high-quality catnip (a full 1/4 cup with no added polyfill or other fillers), this fabric toy is made of durable 100% cotton canvas twill and features yarn "spaghetti noodles" at each corner for extra enticement. The toy measures 4.5 x 5 inches (not counting "spaghetti"). Click on an image for details. There are 8 different designs--which is your favorite? 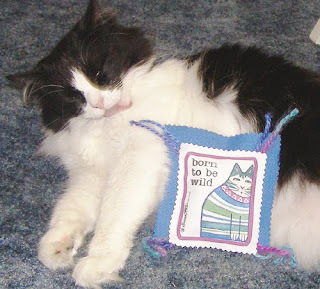 Tell us in the Comments at the end of this post (use the caption on the toy to identify your favorite) and you will be entered into a drawing to win the catnip toy of your choice. One name will be drawn on Monday, May 31 at 8 pm PST. Please make sure that I have a way to contact you in case you are a lucky winner, such as a link to your blog or e-mail address included in the comment. 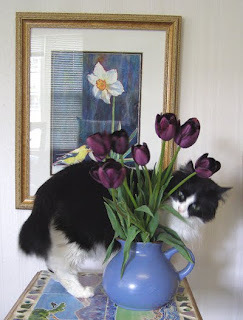 Nepetalactone, one of catnip's volatile oils, enters the cat's nasal tissue, where it is believed to bind to protein receptors that stimulate sensory neurons. These cells, in turn, provoke a response in neurons in the olfactory bulb, which project to several brain regions including the amygdala ...and the hypothalamus...The amygdala integrates the information flow from the olfactory bulb cells and projects to areas governing behavior responses. The hypothalamus regulates neuroendocrine responses through the pituitary gland...the cat essentially reacts to an artificial cat pheromone. 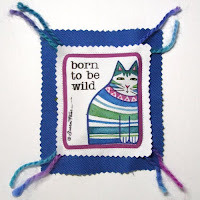 Apparently there are a number of unfortunate felines in the world who are not susceptible to the allure of catnip. 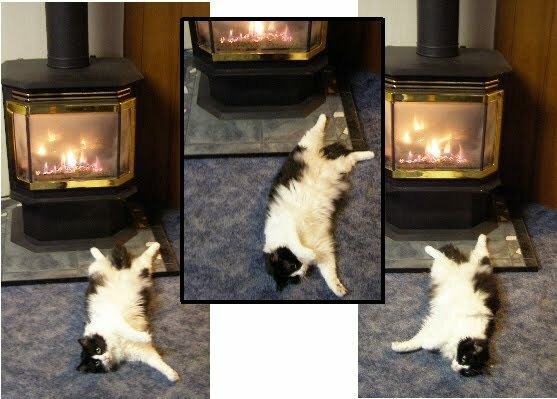 Scientists estimate that as many as 25 percent of all cats have no reaction whatsoever to its intoxicating effect. 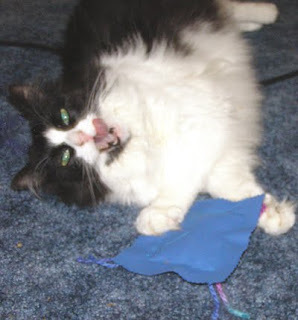 We'd like to do our own research to verify or debunk this startling number of cats who may be immune to catnip. Please take the Very Scientific Poll in the top right corner of this blog to help advance Cat Science. You may enter an answer for each of your cats. Thank you for participating! Buttonwillow Asks: Hey, What's Wrong With Pose A? Two weeks ago our kind readers were asked to help studio assistant Buttonwillow fulfill her lifelong dream of becoming an artist's model. She posed for a new painting to be called "Still Life with Bicolor Cat", and we showed 3 different poses and asked which one should be used for the painting. As of this writing, pose B is in the lead with 23 votes, pose C is the second favorite with 9 votes, and pose A has but ONE measly vote. Buttonwillow asks: "What gives?" Here is Pose A, which Buttonwillow describes as the most intensely difficult of the three. "I had to actually sit still for at least THREE whole seconds. I was going for the stoic, pensive look, with just a touch of mystery--leading the viewer to wonder: 'Is she looking at a bird through a window? Is she contemplating her inner vulture? Is she waiting for the food dish to be filled?'" Buttonwillow's Dream Job...and a Giveaway!! Voting ends tomorrow, May 28, at 7 p.m. PST, and I will paint the version with the most votes, showing the step-by-step process in future blog posts. 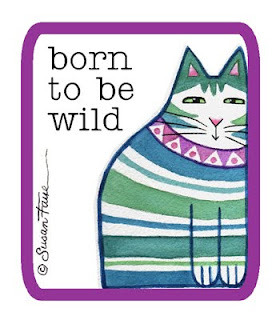 And here's the good part: Each person who votes will be entered into a drawing for a chance to win one of three prizes featuring my brand new Crazy Cat Lady design: A blank book/journal ($10.99 value); a magnet ($4.49 value); or a ceramic tile coaster ($6.50 value). Three names will be drawn at random on May 28 and items can be shipped to anywhere in the world. That's right, you have three chances to win! So what are you waiting for? Please help make Buttonwillow's dream come true! 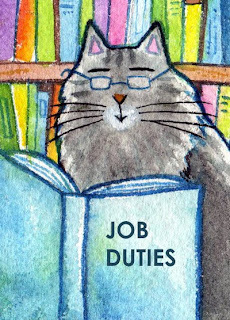 Hi everybody, I thought it would be nice to tell you about one of my jobs at the library. I only have to do it once a year, but it's very important. 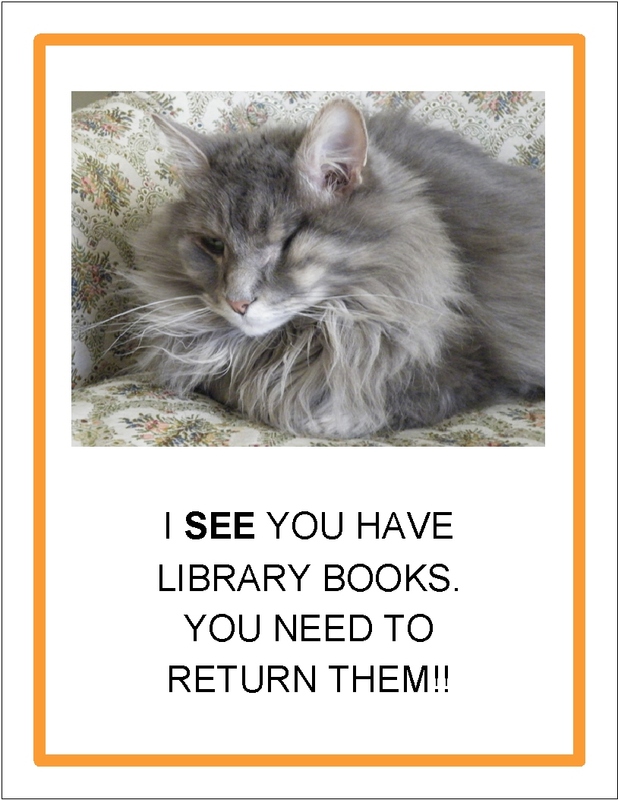 We put up my posters (like the ones below) all around school to remind teachers and students to RETURN YOUR LIBRARY BOOKS! I've heard from reliable sources that George Washington has had two books overdue for more than 200 years! I hope nobody follows his example, because life goes on just a bit easier if little things like due library books are taken care of in a timely manner. There is a time for everything. Just do it if it needs to be done, and life will remain a little less complicated. 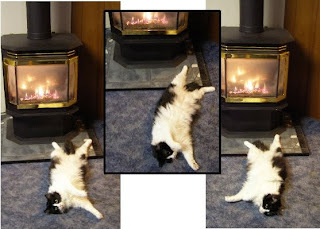 "Cat Lady Jolene lives in Milwaukee, Wisconsin, with her two kitties and her husband. Jolene rescued her grey tabby Monka when he was found as a kitten outside the movie theater where she was working. Monka was the name she called a favorite stuffed monkey that she had as a child. "Jolene and her husband Paul met at that same movie theater, and although he was not too thrilled about cats, Jolene made it clear--love me, love my cat. It wasn't long before Monka had won Paul over. "Paul is a school teacher in Milwaukee, and one of his students honored him by naming their cat after him. When the cat gave birth to a single kitten, the student convinced Paul that he should adopt the kitten. Jolene had been wanting a friend for Monka, so she was thrilled when Paul brought Biscuits home. Biscuits and Monka are fast friends. "When Jolene is not busy playing with the cats, she might be spotted knitting, making jewelry, or working in the garden." 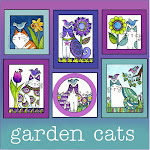 You'll find this design on tees, totes, aprons, mugs, note cards and more! 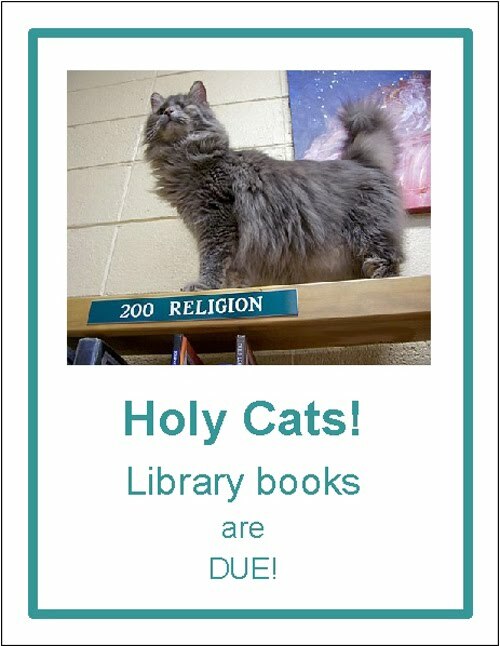 In our last post, Paddy the Library Cat mentioned the importance of The Naming of Cats. 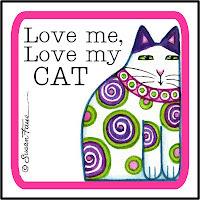 I am constantly amazed and amused by the names that Cat Ladies come up with for their favorite felines. 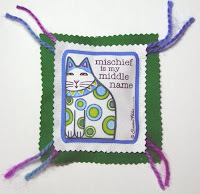 Today's focus is on white cats and their monikers. Some old favorites include: Frosty, Sugar, Angel, and Snowball. What are YOUR favorite names for a white cat? My auctions on Ebay this week feature ACEO artwork of snowy white cats. 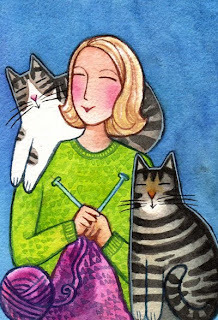 Each one of these original mini watercolor paintings was a part of the 365 Cat Ladiesseries featured in this blog during 2009. 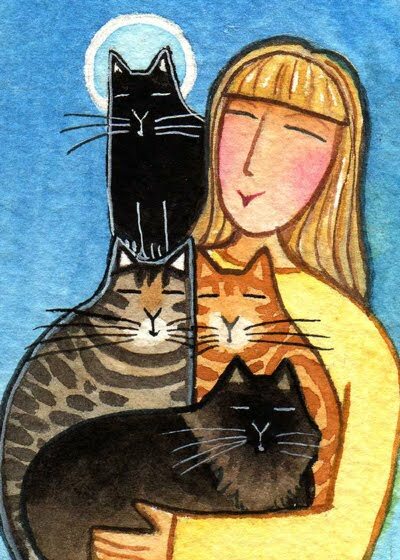 Here is your chance to collect original artwork without breaking the bank, plus you will own a little piece of 365 Cat Lady history! Auctions end Sunday afternoon, May 23. Hi, It’s me again, Paddy the Library Cat, and I would like to tell you about a most amazing and magical little book. It’s by T.S. Eliot who lived from 1888-1965. He’s a very famous American and English poet, but don’t let that scare you away from this poetry/story book: Old Possum’s Book of Practical Cats. The musical CATS comes from this book. 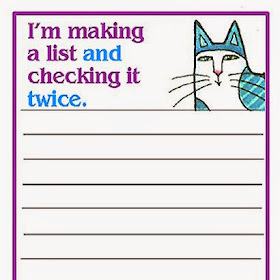 I think that everybody has a secret name; you do and your friends do, just like your cats. It’s a deep down name that can make you laugh and make you strong and make you confident in YOU! And the best part is that only YOU know it--if you choose to know it. I know mine. Do you know yours? 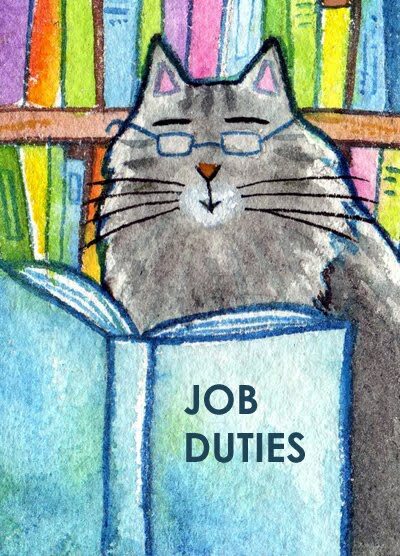 Deep down it’s all OK.
Paddy The Library Cat is a new columnist here at 365 Cat Ladies and Friends. 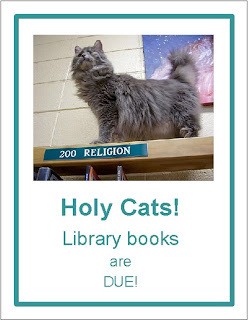 He is the Library Cat at Pacelli High School in Wisconsin. ...her longtime dream is to become an artist's model. You can help turn her dream into a reality! Please vote by entering your preference in the Comments section below. Voting will end Friday, May 28, at 7:00 PST and I will paint the version with the most votes, showing the step-by-step process in future blog posts.